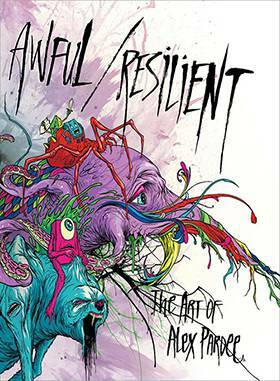 Northern California based artist Alex Pardee has been creating fantastical garish and tortured creatures in both the fine and commercial art capacities for over a decade. He has gained notoriety working with Warner Bros., Reprise Records, Upper Playground, Hurley International, RIDE snowboards, Definitive Jux records, and for creating artwork for bands such as The Used and Primus. Pardee also collaborated with director Adam Green on the feature film Digging Up the Marrow in 2014. 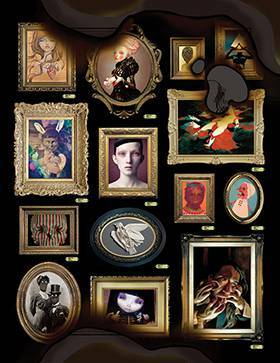 This revised edition of Pardee’s first book features a completely new cover, contains illustrations, photos, and artwork, and chronicles collaborations Pardee has had with Craola, Sam Keith, and Dr X. The first page of the collection looks like yellow line paper, keeping with Pardee’s theme of creating his perfect notebook. Awful Homesick also features a foreword by Jeben Berg. 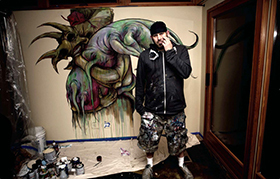 Artist, writer, and apparel designer Alex Pardee has exhibited his highly recognizable art throughout America and abroad in both solo and group shows. Born in Antioch, California, on February 5, 1976, Alex is a pioneer in trans-media artistry, bringing his unique style and aesthetic to all platforms, including numerous creative director credits for music, animation, and film projects. His work has been used by bands The Used and In Flames, as well as by hip hop artist Cage; he also contributed work for the TV/film projects Chadam & Zack Synder’s Sucker Punch, for which he created art for the film itself and for the launch of the films marketing campaign. In 2015 his art was featured in the horror film Digging Up the Marrow, which he created in collaboration with director Adam Green. 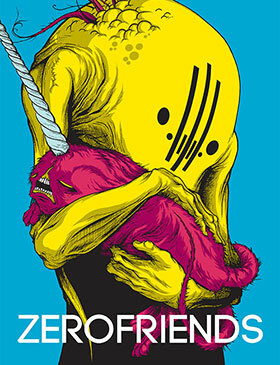 In 2007 Alex and his two closet friends co-founded the successful art and apparel company Zerofriends. The project began as series of pop-up stores on both coasts, but soon transformed into a permanent storefront in the Haight neighborhood of San Francisco. The collective provides him and several other notable artists a marketable retail extension of their artwork and storytelling. Alex recently left the Bay Area for a new home base in Orlando, Florida.